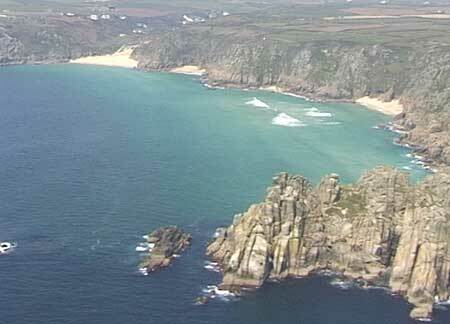 Porthcurno Beach is located some three miles east-southeast of Land`s End , as the crow flies. A beautiful southeast facing beach in the western corner of the very lovely Porthcurno Bay ; bordered by the Minack Theatre to the west ;and Green Bay , Pednvounder Beach and the famous Logan Rock to the east. 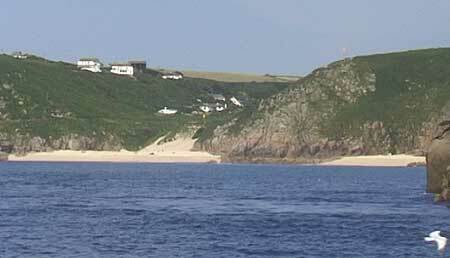 Porthcurno beach , with Green Bay on the right. Access to Porthcurno Beach is very straightforward . A large car park some 200 yards from the beach leads to a wide footpath which gently slopes down to the shore. There is a Cafe just across the road from the car park ; and The Cable Station , just up the road from the park, serves meals and drinks all day in season. There are public toilets and a public telephone in the car park. Porthcurno is about 3 miles from Sennen Cove. Follow the A30 towards Land`s End ; turning left onto the B3315 for Porthcurno. From Penzance, take the A30 towards Lands End. Turn left at Catchall (3 miles) onto the B3283 for St.Buryan. Pass through St.Buryan and continue on for Porthcurno ; passing the left turn to Treen and The Logan Rock. 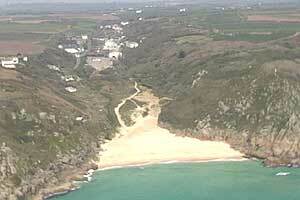 Take the left-hand turn to Porthcurno , about two miles after the turn to Treen. The beach is patrolled by lifeguards between Whitsun and the middle of September. A dog ban is enforced between Easter and the end of September .